The Oregon Scientific Rain Gauge with Indoor/Outdoor Temperature is an innovative wireless instrument that includes a handy self-emptying rain bucket! Featuring a stylish digital base unit with easy set-up (no wires or cables), this affordable rain gauge provides cumulative and daily precipitation rain totals for up to ten days. This special long-range capability means you can place the rain collector up to 300 feet(100M.) away from the base unit (unobstructed). 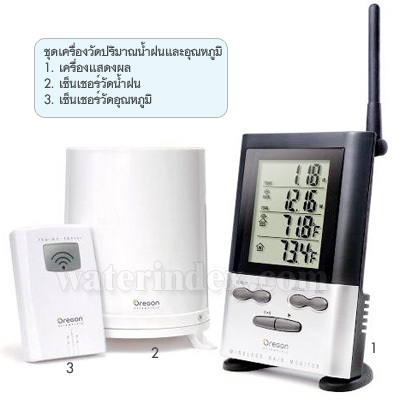 Indoor/Outdoor temperature displayed in either Fahrenheit or Celsius mode. Rain collector diameter is 5.51 inches. Temperature sensing cycle approximately every 30 seconds. Records and saves cumulative and daily rainfall totals for up to 10 days. Rainfall amounts measurable in inches or centimeters. Base unit powered by 2 AA batteries. Rain collector powered by 2 AA batteries. Sensor powered by 2 AAA batteries. Actual size: 5.25" x 3.5" x 1.5"